Top trolling As is usually the case with the launch of a new iPhone, Apple stores around the globe are seeing lines of people waiting to get their hands on a device. Taking advantage of the waiting masses at Singapore’s store was Huawei, which managed to promote some of its products while trolling Apple. 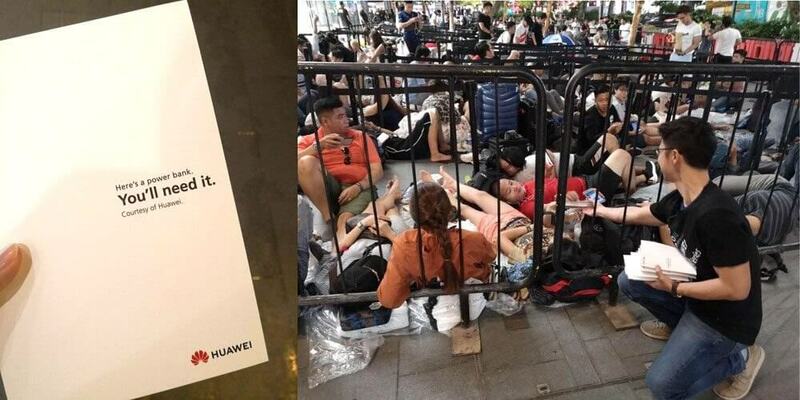 As reported by CNET, Huawei arrived at the Singapore outlet at 11 pm local time the night before the store started selling the new iPhones. The Chinese firm handed out its power banks to the waiting customers, which it said was to "offer respite from the weather and grueling wait." Huawei has been promoting its triple-camera P20 Pro recently. Not only is the handset one of the best phones you can buy right now, but it’s also several hundred dollars cheaper than Apple’s pricey iPhone XS and XS Max. One of the most praised features of the P20 Pro is its 4,000 mAh battery unit, which has been described as offering “Epic” all-day battery life. August saw two separate industry analysts reveal that Huawei had replaced Apple as the world’s second-largest smartphone vendor. We’ll soon find out if the latest iPhones have helped Apple reclaim the spot. In other iPhone launch-related news, UK-owned company Deliveroo was taking orders and delivering food to those waiting outside Apple’s stores in locations around the world, ensuring that no hungry customers lost their place. The option was available in 12 countries, but the US wasn’t one of them.